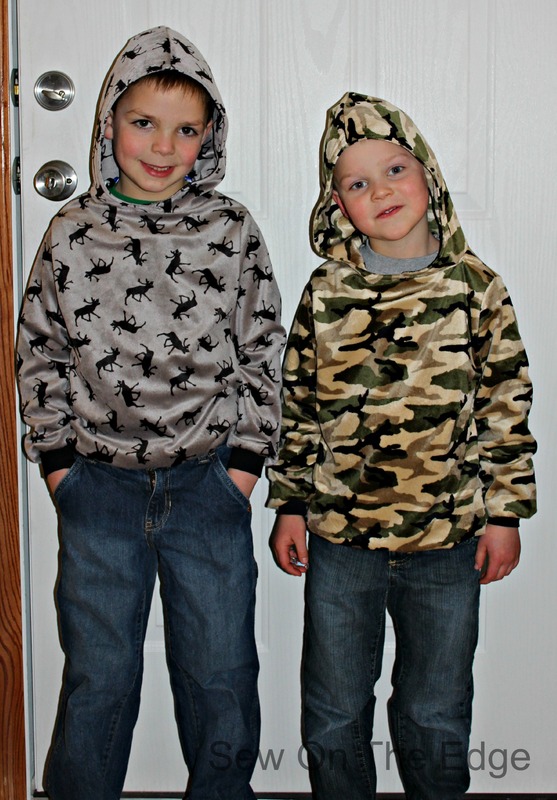 Every year I can’t wait to see what my boys decide what they want to be for Halloween. The last 2 years they have tried to coordinate costumes, which cracks me up. 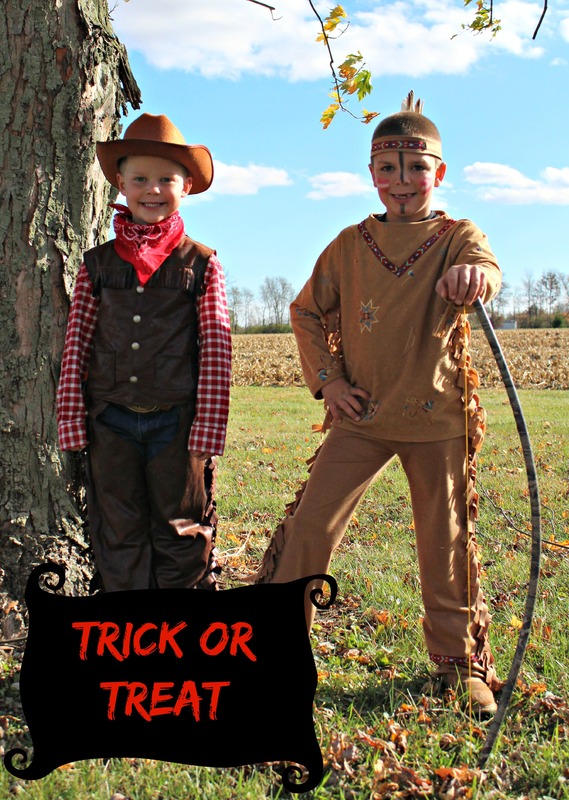 This year after several I’m going to be _____, they finally decided that they were going to be a cowboy and Indian. Once the decision is made, there is a week of me asking what are you going to be for Halloween, just to make sure they are still on the same idea before any purchases are made. And they both stuck with the cowboy and Indian idea! 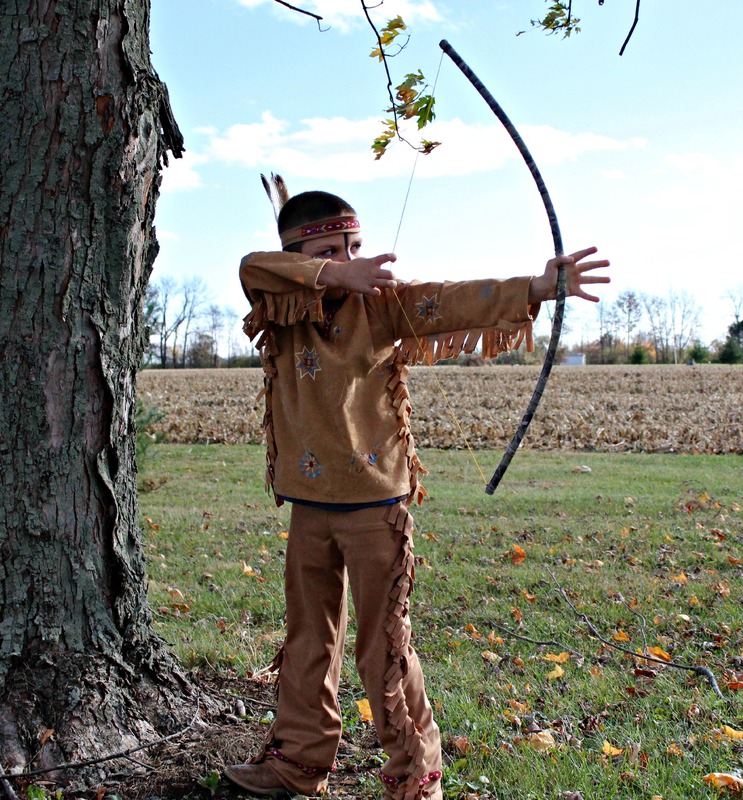 For the Indian costume my son had lots of big ideas, including me making him a full head dress. I am all for a sewing challenge, but was just not up to that one, being our first Trick or Treat was mid October. So we decided on something much simpler a shirt and pants with fringe and a headband with feathers. The material I used was in the costume section of Joann’s. 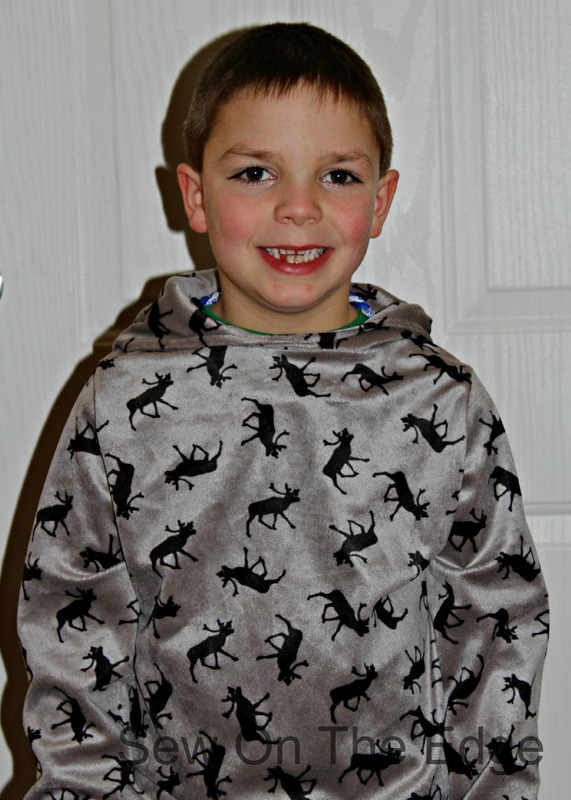 For the pants I just took a pair of pants that currently fit him and made a pattern, there are several tutorials on how to make them, like this one for pajama pants. 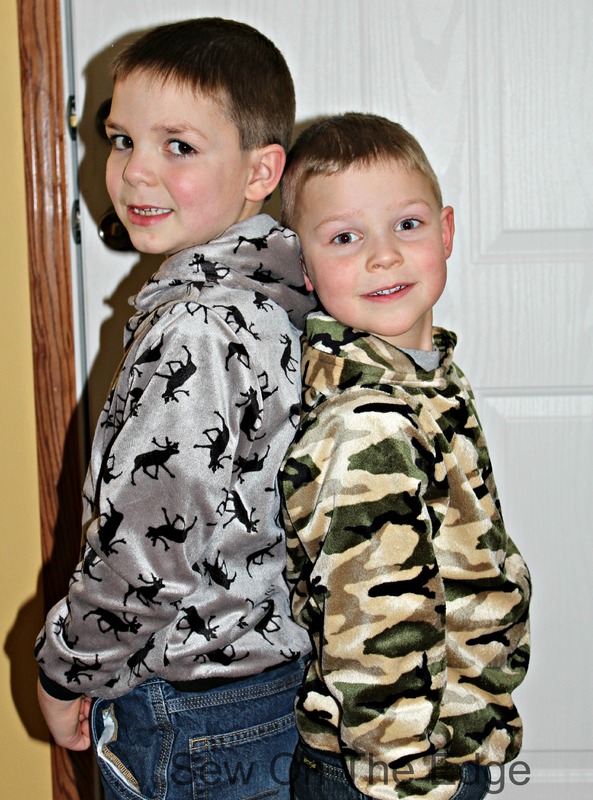 For the shirt I used the free sweatshirt pattern from Shwin and Shwin, I have used this pattern for several sweatshirts for my boys and the fit is great. For the fringe I just folded a long pieces of fabric and cut it about every 1/2 inch and sewed it into the seams, best thing about most costume fabric is it does not fray therefor no finish needed. But I have to be honest, I did finish the edges on the shirt, I think it would have bothered me every time I looked at it (that is my struggle :), by all means leave it unfinished..less work) I found some Aztec trim that I used for the front of the shirt, bottom of the pants and for the headband. All in all this costume went together in about 2 hours, which made me happy. Even though we did not do all his ideas, my son still loved it. 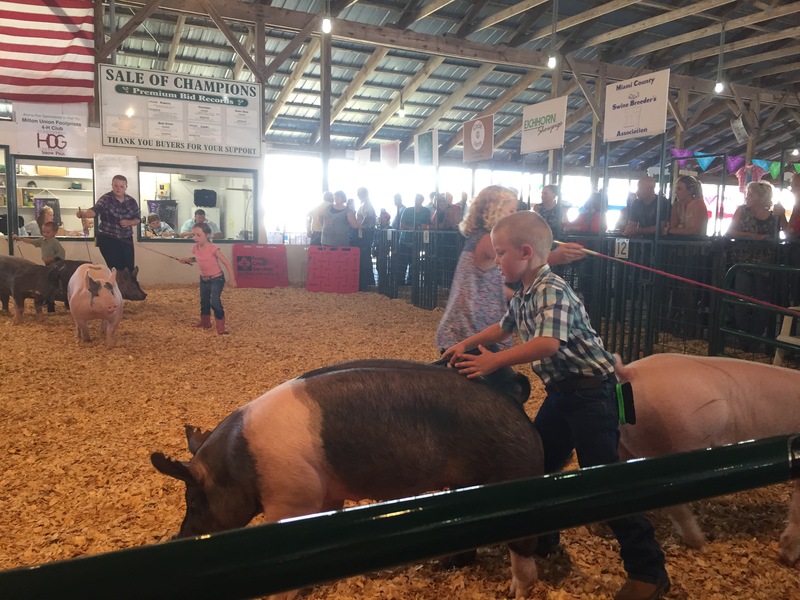 My youngest just keep telling me he wanted to be a cowboy, so that gave me free reign to make what ever I wanted for him. 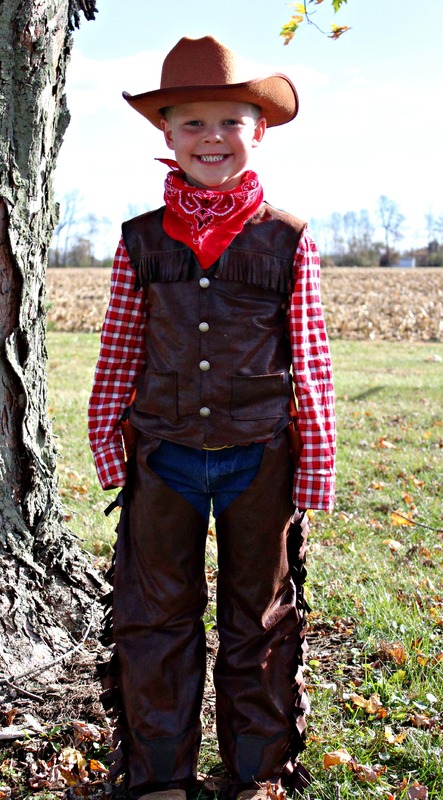 So after going on Pinterest and looking at cowboy costumes, I came across a cute cowboy costume at House of Noise..I mean boys. I picked out some faux suede at Joann in dark brown, again using a fabric that does not fray makes sewing costumes much faster. 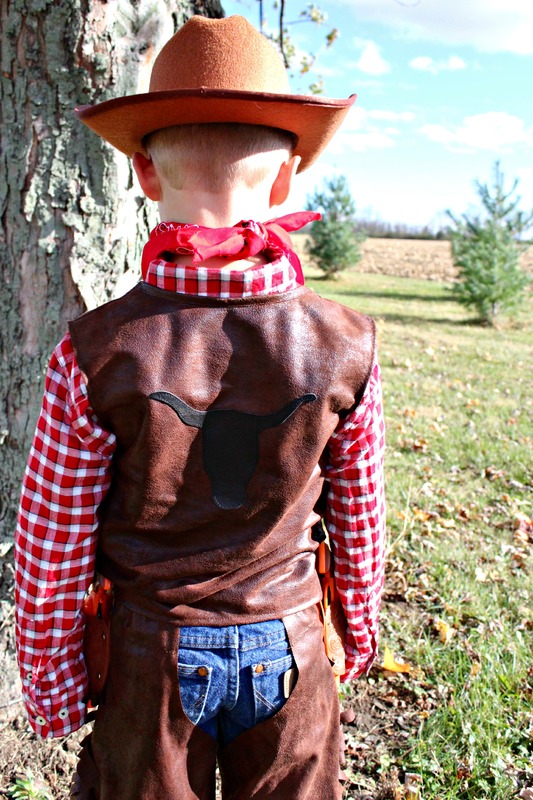 I used her method for the chaps and vest, using a pair of pants and shirt that currently fit my son for the pattern. When cutting out the vest pattern I just eyeballed where I thought it should v down for the vest, making sure that I had enough fabric to fold under, since I was going to put buttons on the vest. I add the fringe down the leg and on the vest, again just taking a piece of fabric and folding it over and cutting every 1/2 inch or so. I also added a bull head to the bottom of each chap and the back of the vest out of black leather. 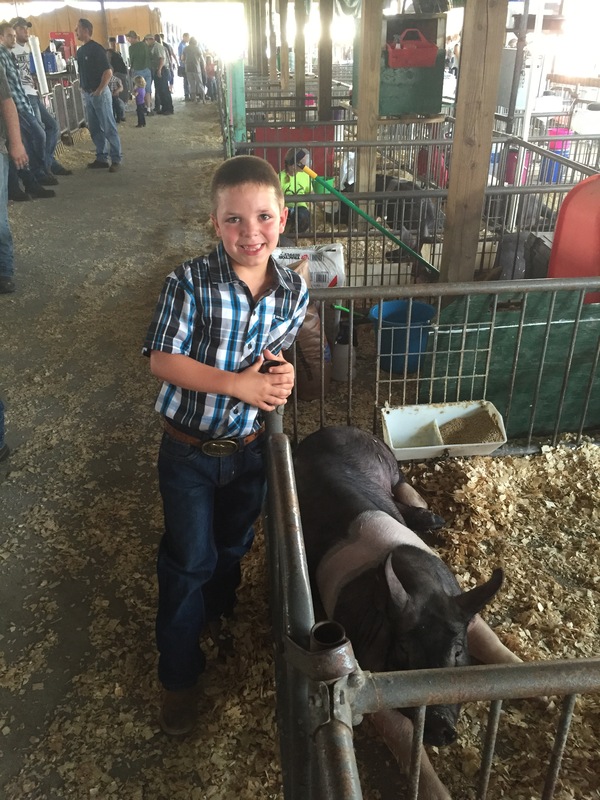 Add a checkered shirt, jean, bandanna, boots and a hat and he is ready to go round up some cattle! Action shot, photo bombed by the cat. I cherish these years where my kids still want me to make their Halloween costumes, in the blink of an eye they are going to be to big to go trick or treating or have mom make them a costume. But for now I love how proud they are of their costumes because no one ever has a costume like theirs. What are some costumes you are making? Wow, I can’t believe that it as been over 3 months since I last blogged. I need to get much better at being consistent as a blogger. 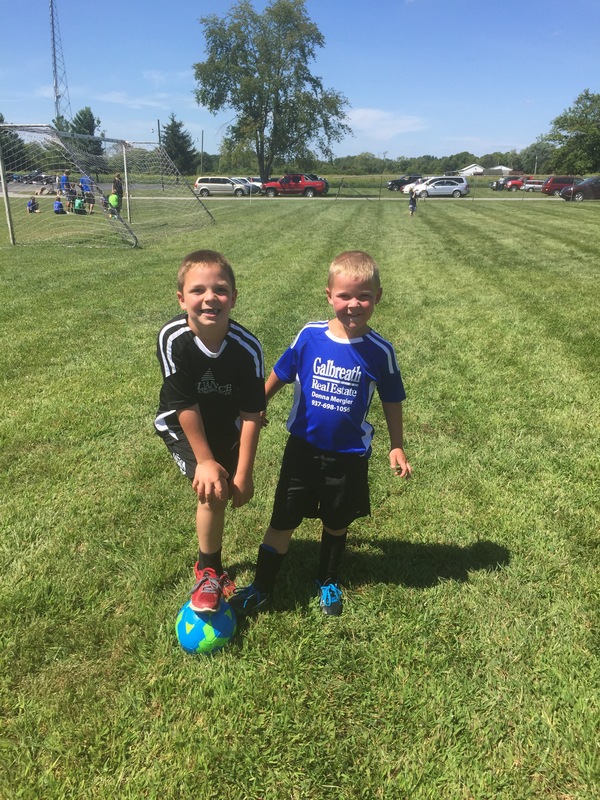 With two active boys summer was packed full of activities from baseball, camping, the county fair, and ending the summer with their first year of soccer. Even with all the activities and working full-time I was able to get some sewing done this summer. 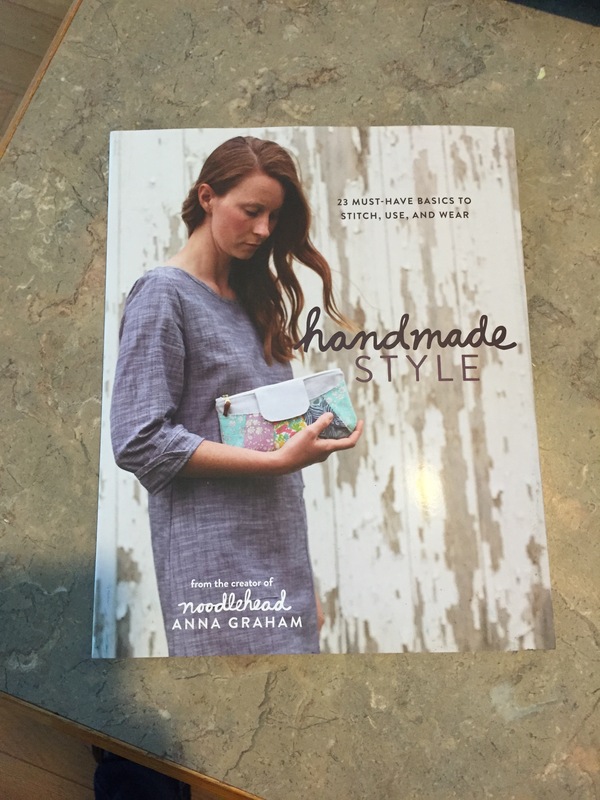 I was so excited for the book Homemade Style by Anna Graham from Noodlehead to come out. This book has some amazing projects that are great for the beginning to advanced sewer. 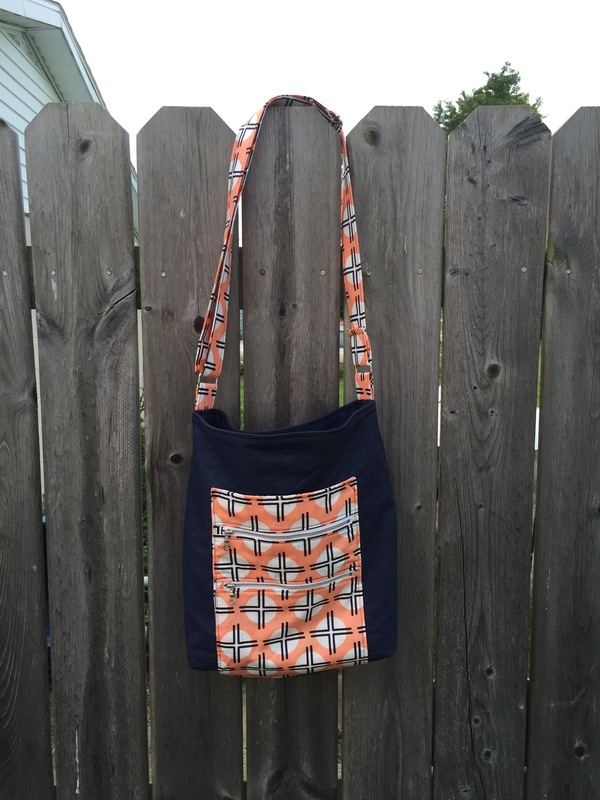 I made the Gingham tote from Handmade Style to enter in the Art Hall at the County Fair, which won 3rd place. I think I need a new game plan for next year if I am going to take home a 1st place ribbon, like picking the ugliest fabric I can find, those seemed to win first prize :). Even though I did not win, I love the this tote and am still using it every day. I can’t wait to make this bag again! With Halloween approaching, are you making any Halloween costumes? 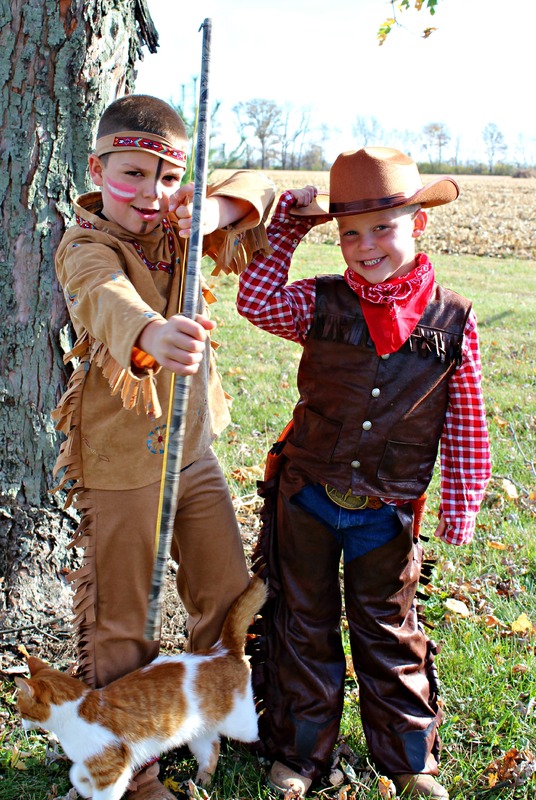 My boys want to be an Indian and Cowboy. I will be sharing their costumes in an upcoming blog. Some might say I am a fabric hoarder, I like believe there are millions of sewers out there just like me. 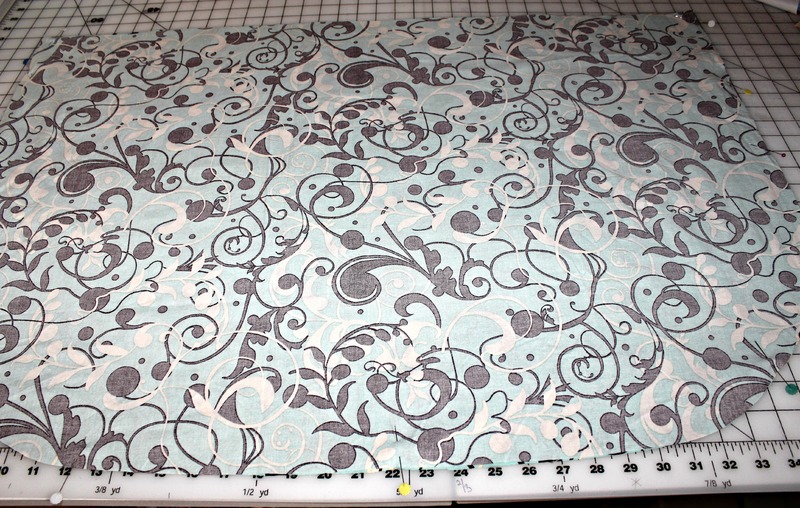 We buy fabric and then never cut it up waiting for that perfect project to come along. Well, years pass and that fabric that we thought was so great ends up not used and buried in a pile of fabric that you forget you have. And as with anything our styles change and that fabric is not something that we even like anymore. Which brings me to the start of what I called my Ugly Quilt while I was working on it. The other week I was looking for some fabric for a project, rummaging through all my totes of fabric that I will say loosely is somewhat organized. I realized I had a ton of fabric from 8 to 10 years ago when I and all my friends were going through our Americana decorating period. If it was blue, red, cream or had stars or stripes on it I thought I needed it for a project. Now not so much, the only thing left from that decorating time are my blue couches and I am not getting new ones as long as my kids still spill stuff on it all the time. 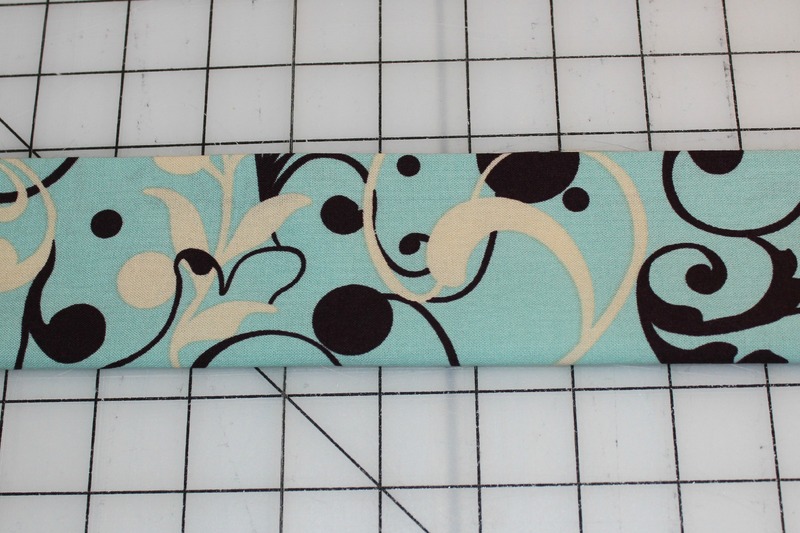 So I needed something that would use up a lot of fabric. I decided that I was going to make a quilt for our camper. Nothing is better than sitting by a bon-fire wrapped up in a quilt, even if it is one that you think is ugly. 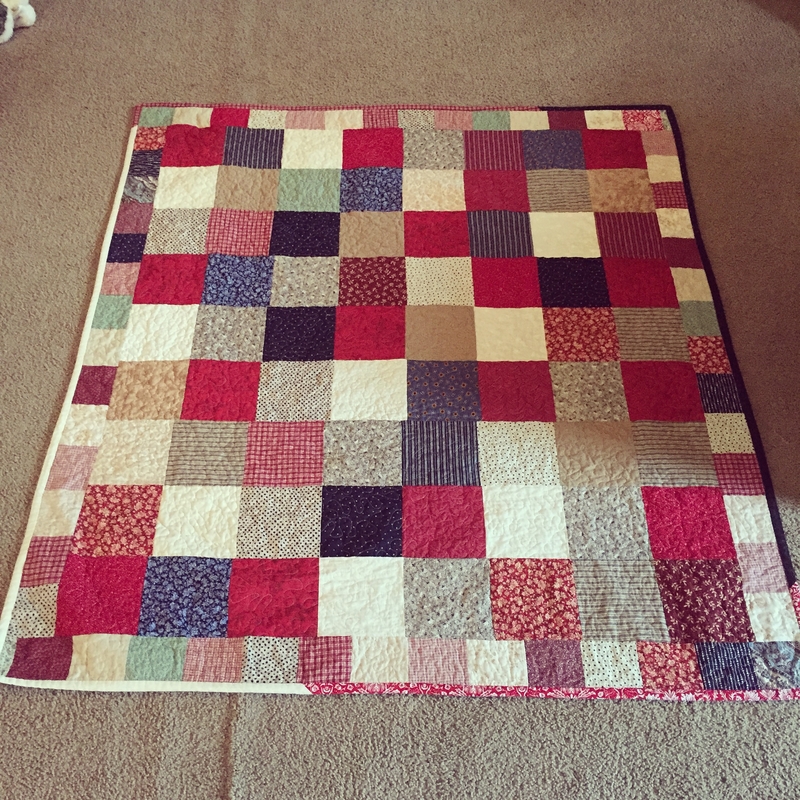 And just as I was thinking about making an quilt all the sudden I had a large block of time on my hands called the 8 days of hell stomach bug that hit my boys. Mind you I was not really happy about this block of time carved out for me, one was my boys were sick and other was the amount of laundry I had to do. 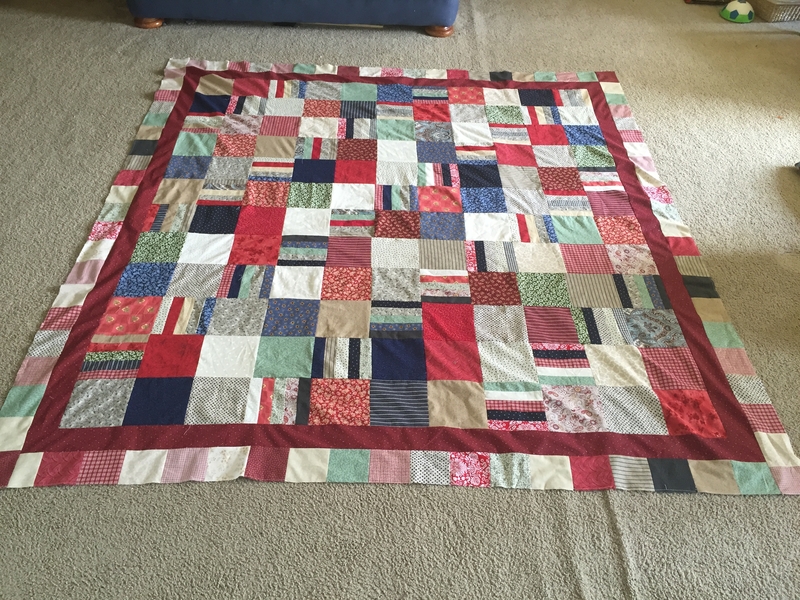 I did not have a quilt pattern in mind when I started this quilt, my goal was to use up most of the Americana fabric and odd other pieces I had accumulated. I just started cutting 6×6 inch squares and scraps I cut into 1.5 inch strips and sewed them together then cut them down to 6×6 in squares. 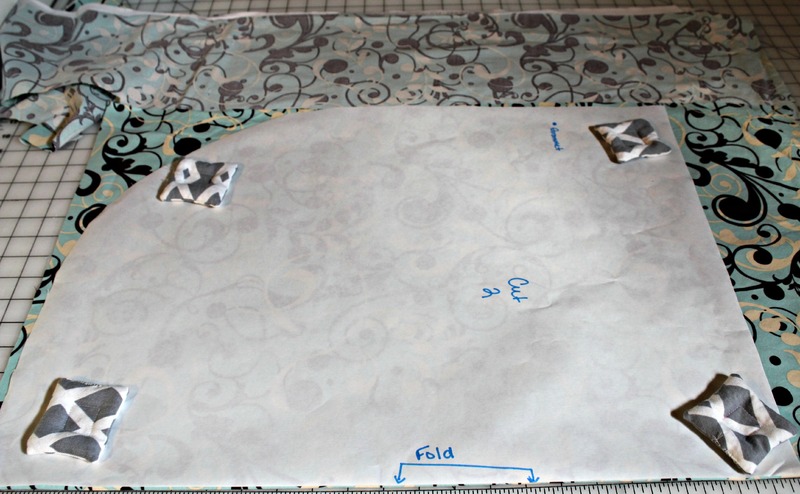 After cutting all my fabric I use a piece of paper to do a simple layout of the quilt. 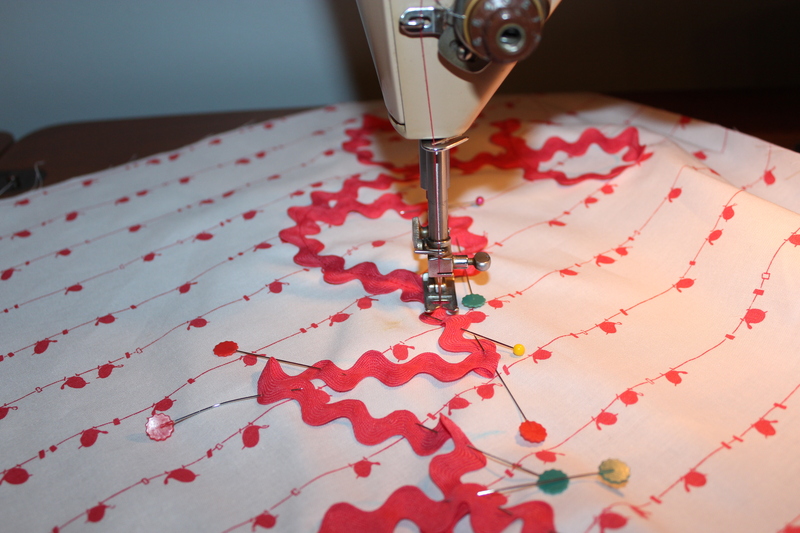 Then started sewing, I mostly used my vintage Singer Rocketter. 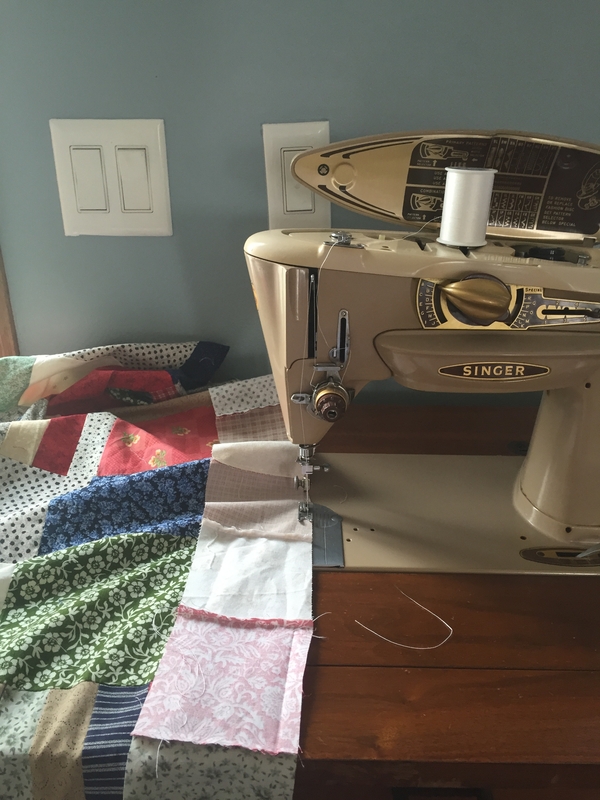 I love this machine, nothing sews as nice as a well working vintage machine. This quilt went together really fast and I have to say by the time that I had it all sewn together, it had really grown on me. It kinda reminds me of something a grandma would make. Very homey. 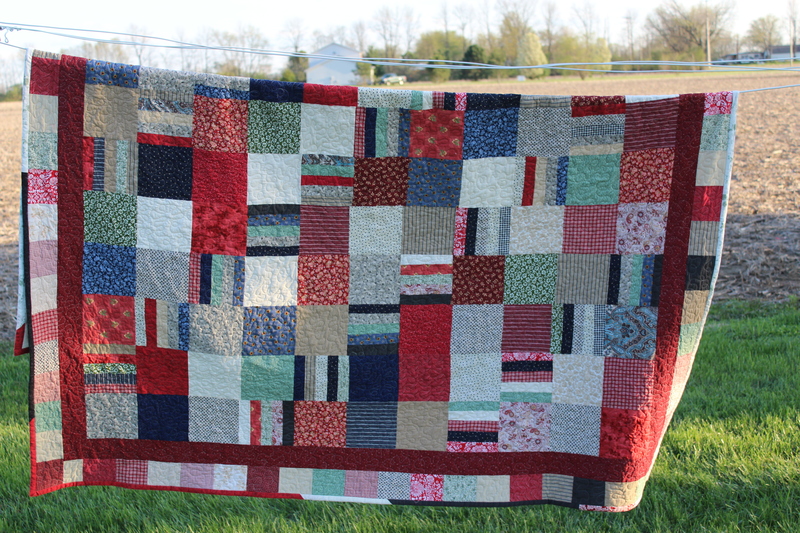 After I had it all quilted together and washed I really liked it. Maybe it is just the fact that it is a quilt and no matter what it looks like there is just nothing better than being snuggled up in a quilt. Thank goodness there was enough left over fabric to make a small lap quilt because my youngest son has hijacked the large quilt for his own. So I guess I will put the little quilt in the camper. We can’t wait to start our summer camping adventures. Spring is here…well at least the calendar says it is…mother nature has not made her mind up yet. With springs comes plans for my garden this summer. I can’t wait to start working the soil, planting my seeds in pretty rows, then harvesting all the yummy summer vegetables. 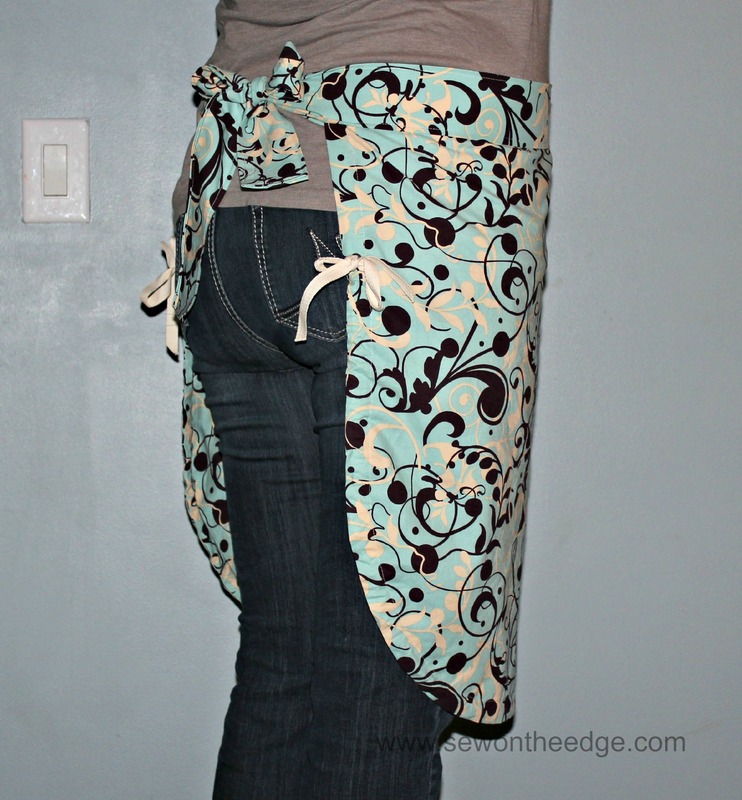 Last summer while looking for garden aprons, I found a picture of an apron on Pinterest that had a pouch for harvesting fruit/vegetables from the garden. What a great idea! I thought I can make that and I love how it turned out, so I thought it would share it with you. 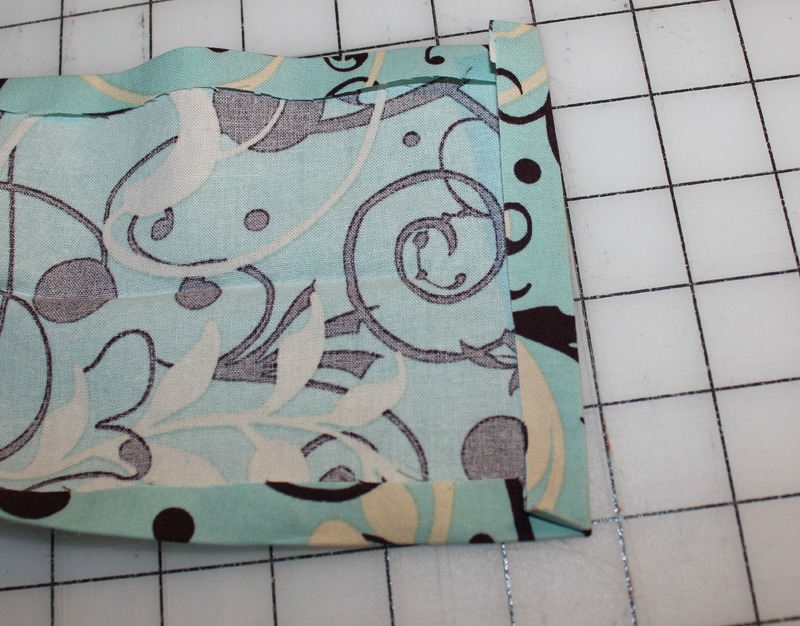 1 3/4 yard of fabric (I used cotton, but any medium/heavy weight fabric would work) or if you are using 2 coordinating fabrics 1 1/3 yards of main fabric and 1/3 yard of contrasting fabric. 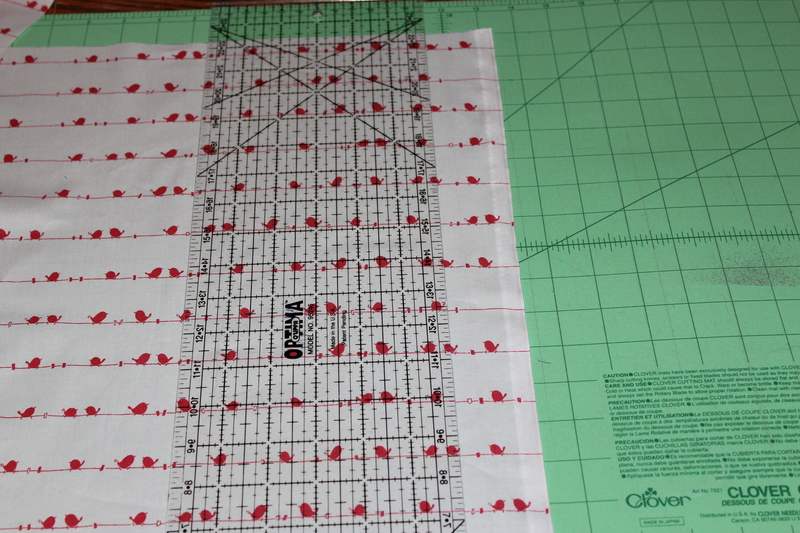 Gathering Apron Pattern- make sure your printer is set as poster/tiles to ensure you get the proper size. 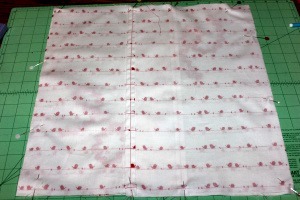 Cut 2 of the main pattern on the fold, mark for grommets on one of the main pieces. 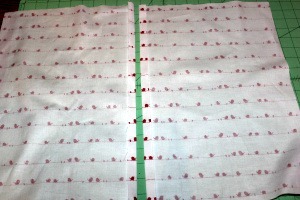 Cut 2 – 36″x 6″ or 44″x 6″ strips for your apron strings depending how long you want them. 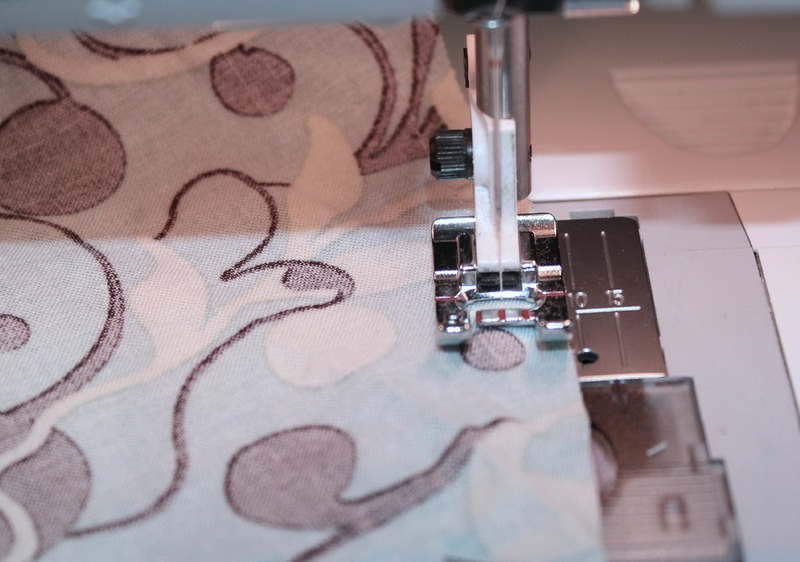 Using your front main piece, reinforce the grommet marking with interfacing. Follow directions on package for installing grommets. 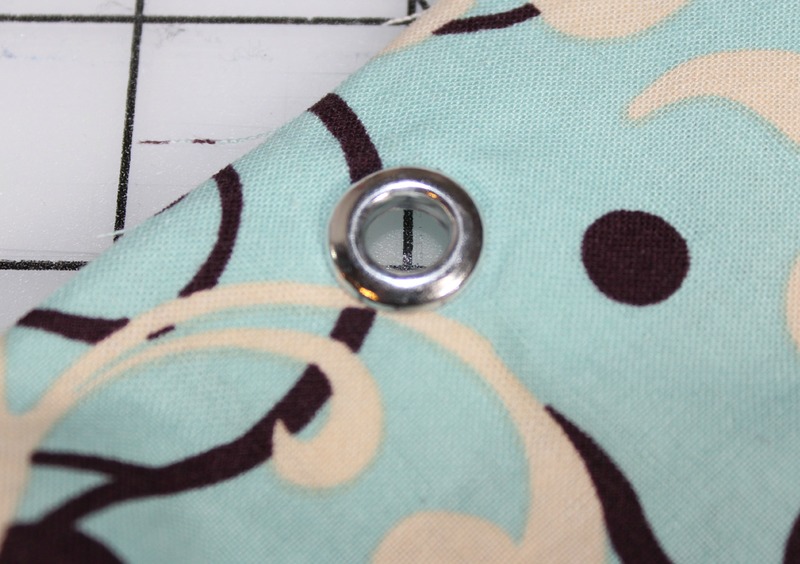 If you don’t want to use grommets you could add a buttonhole. 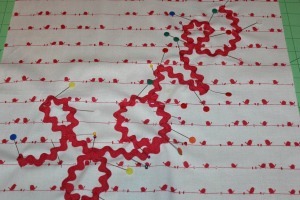 With right sides together of main pieces, pin around sides and bottom. Leaving the top open. 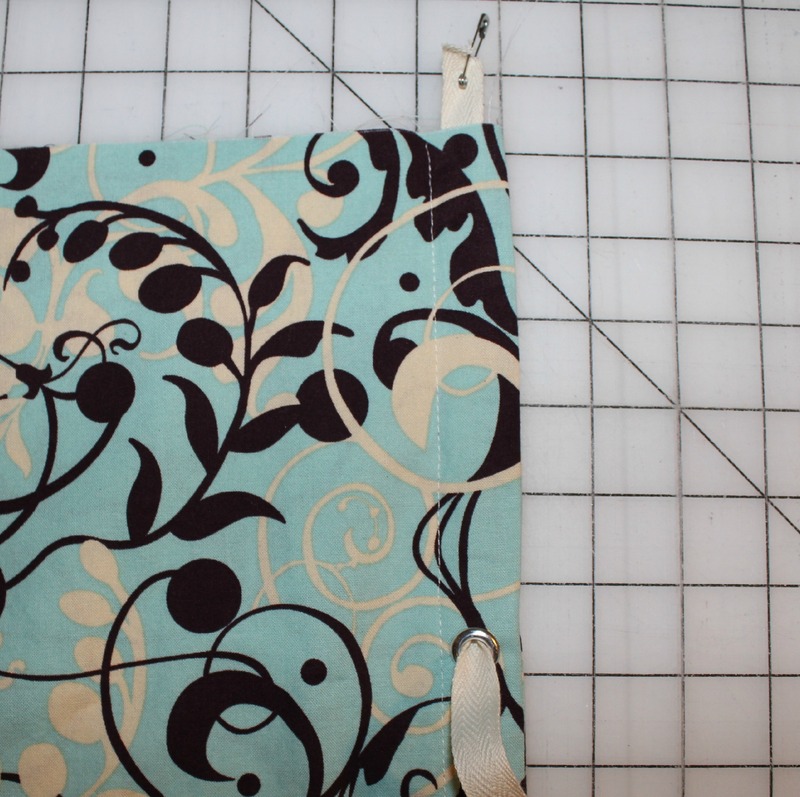 Sew 3/8″ seam around sides and bottom. Clip curves, before turning right side out. 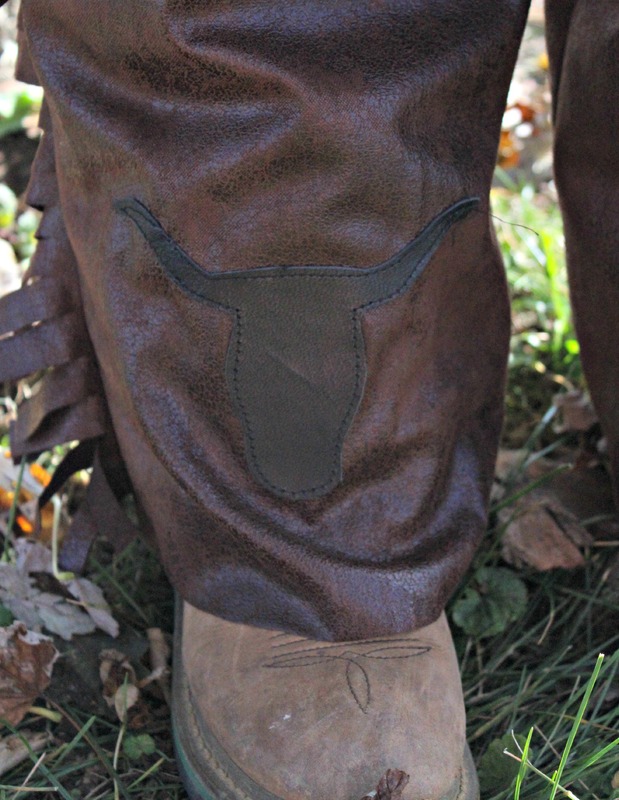 Top stitch around the edge with a 1″ seam, making sure you have enough of a seam to miss the grommet. 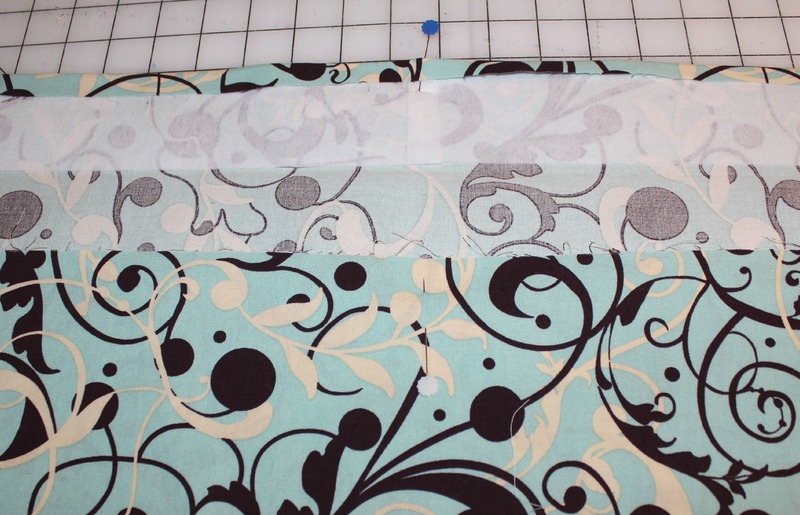 Cut 2 – 18″ Twill Tape/Ribbon, you can use a fray check on the ends if you would like. 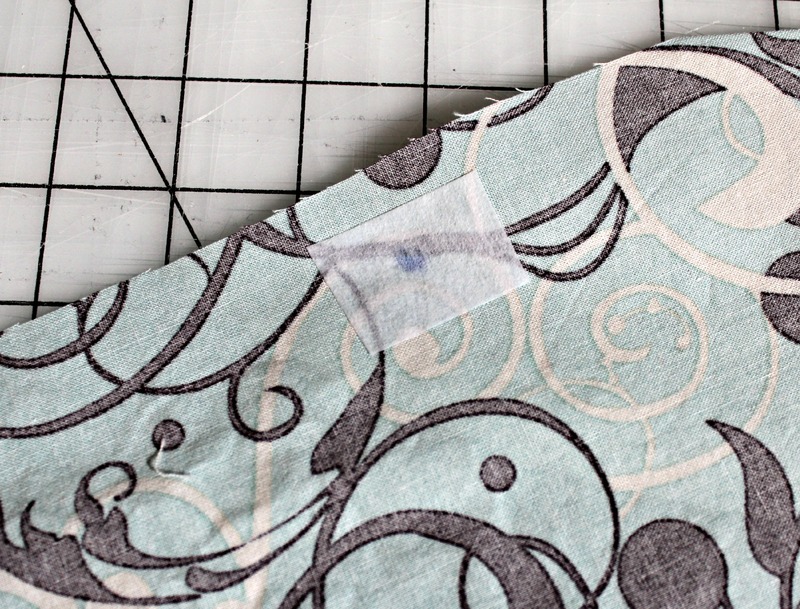 Use a safety pin to string the Twill Tape into the casing you made towards the top of apron. Repeat on the other side. 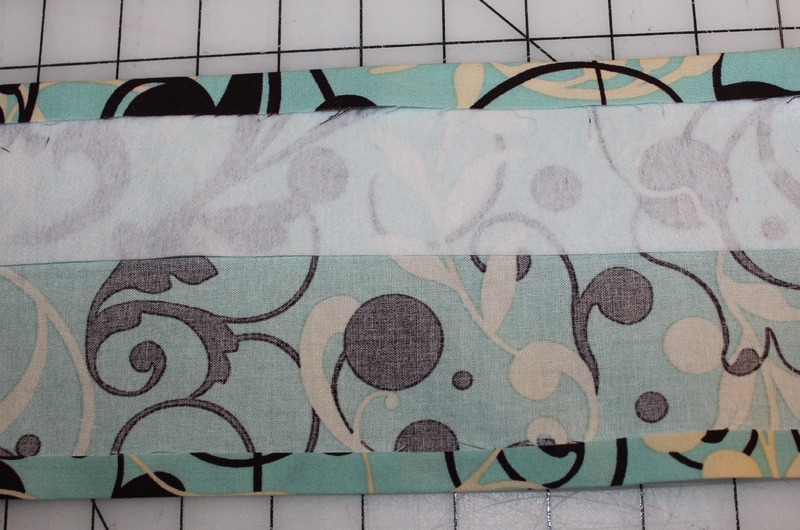 Stitch across the top, back and forth a couple times to hold the twill tape on both sides. You can also baste across the top of the apron if you want at this point. 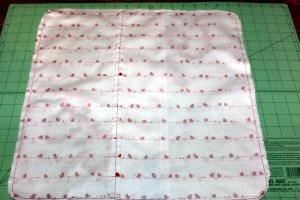 Sew your 36″x 6″pieces with right sides together, so you have a finished 72″ x 6″ piece. Press the seam open. This will become your apron strings. 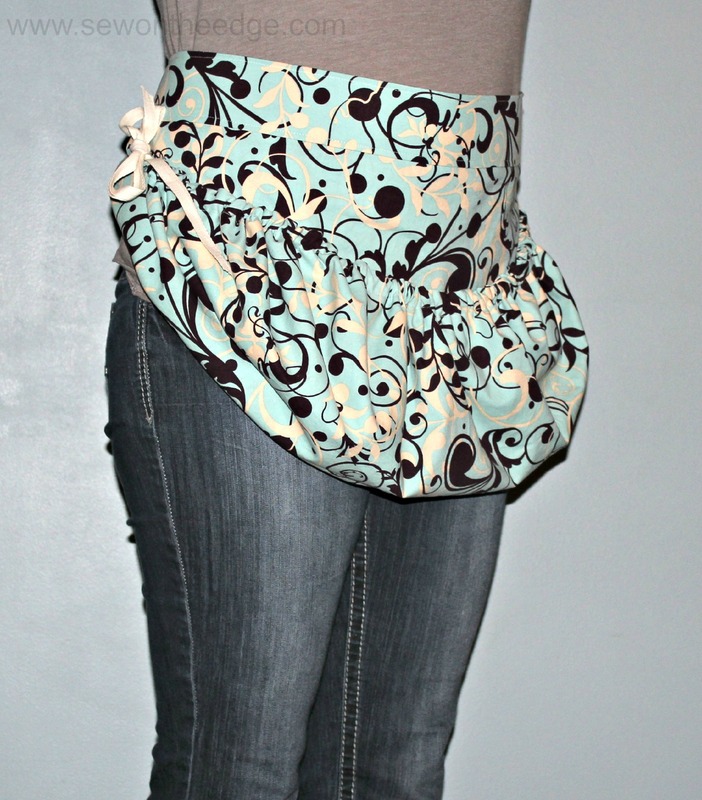 Fold apron string piece in half long ways and press with wrong sides together. 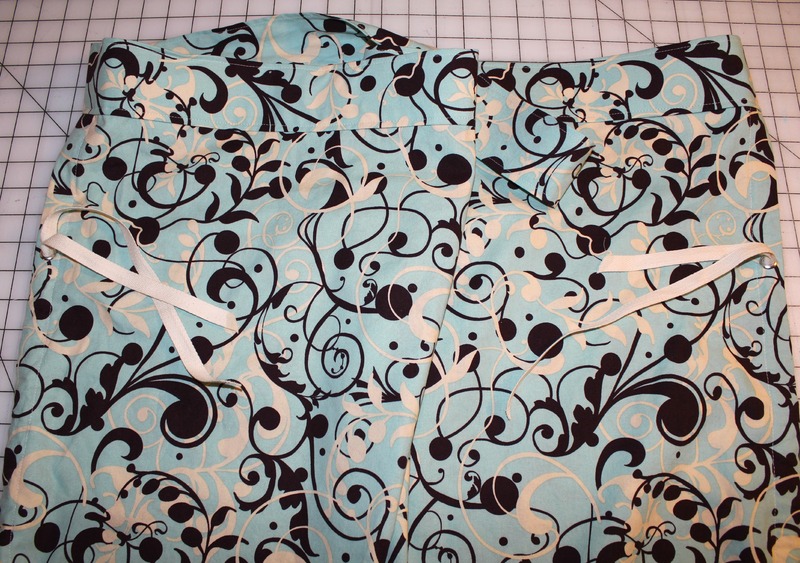 Find the middle of the apron string, take your interfacing piece and match the middles up and press interfacing to the wrong side of one of the halves of the apron string. 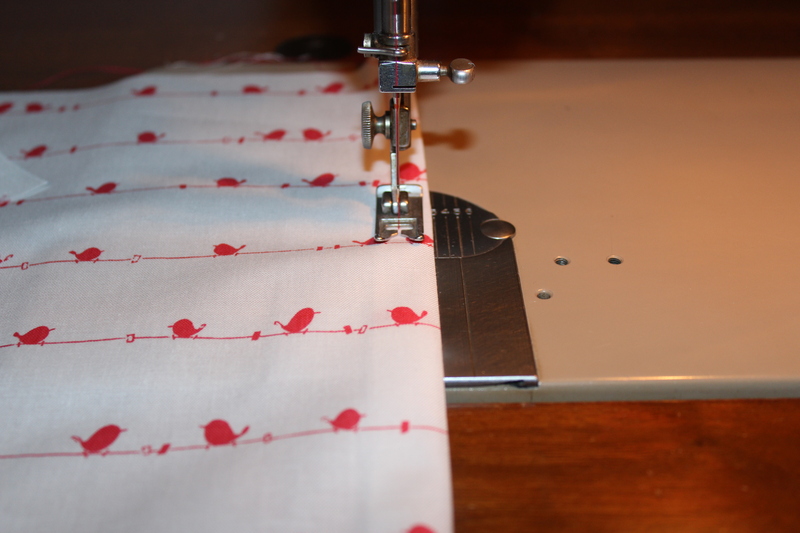 Fold and press both sides of apron strings up 1/2 inch. Fold and press both ends in 1/2 inch. 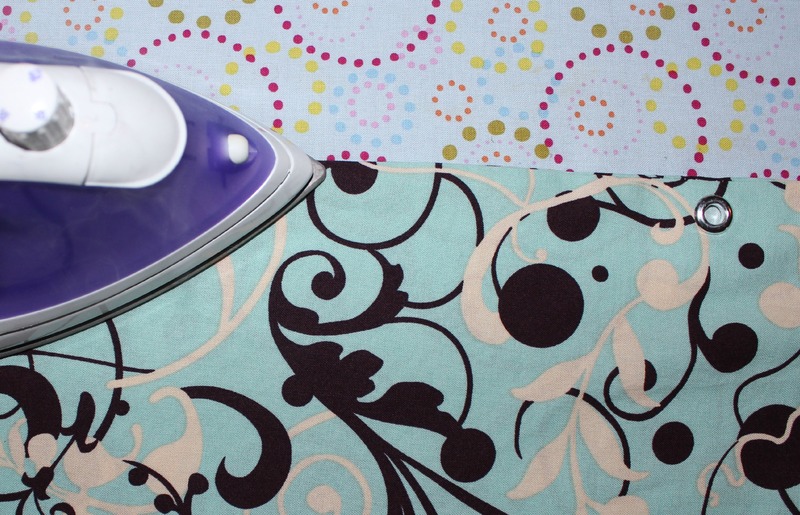 Fold in half and press together. 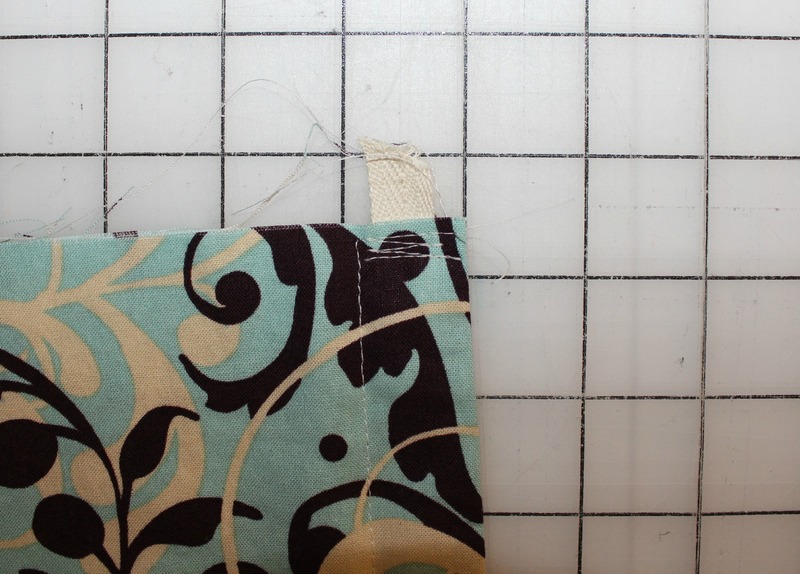 With your main piece find the center of the top and mark, I just used a pin, but you could also use a marking pen. 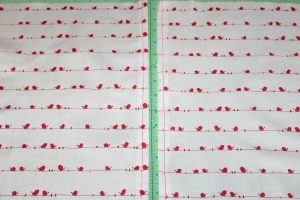 Find the middle of your apron strings and match with the top of your apron. 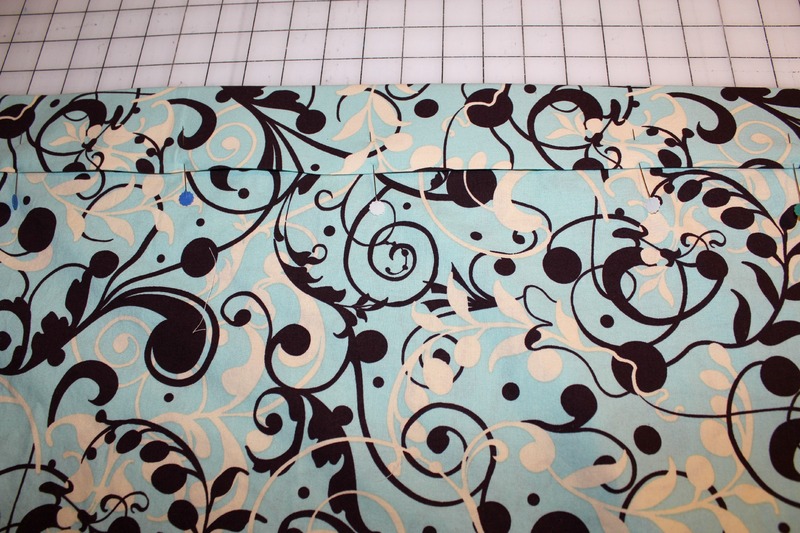 Making sure that the side with the interfacing is at the top. 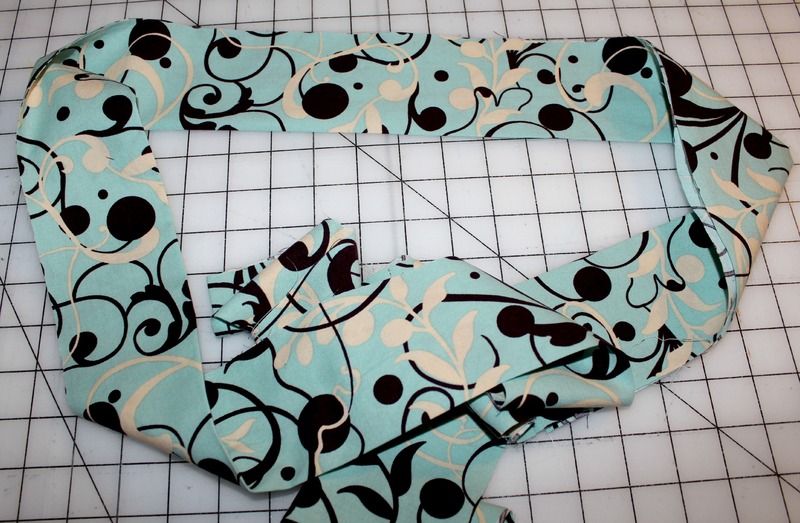 Fold over apron strings, making sure to sandwich 1/2 to 1 inch of the top of the main piece in between. Pin across the front of apron and down to the ends of the strings. 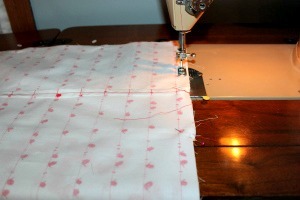 Starting at one end of your apron string sew down one side and across the bottom of apron strings. Go slowly across main part to make sure that you are catching the backside of the apron strings. Top stitch across the top of the apron strings. 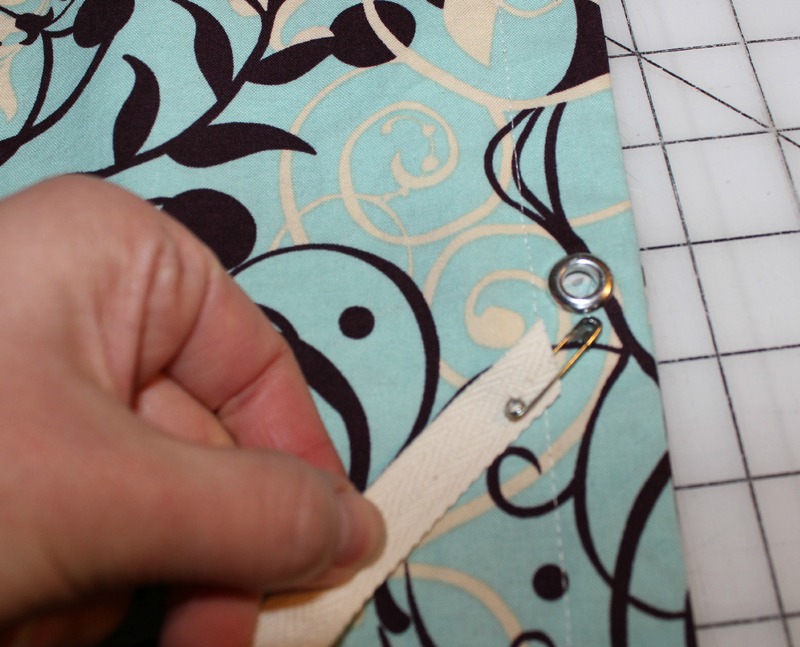 With your remaining 2 yards of twill tape/ ribbon, again use a safety pin to insert it into the casing around the bottom of the apron. 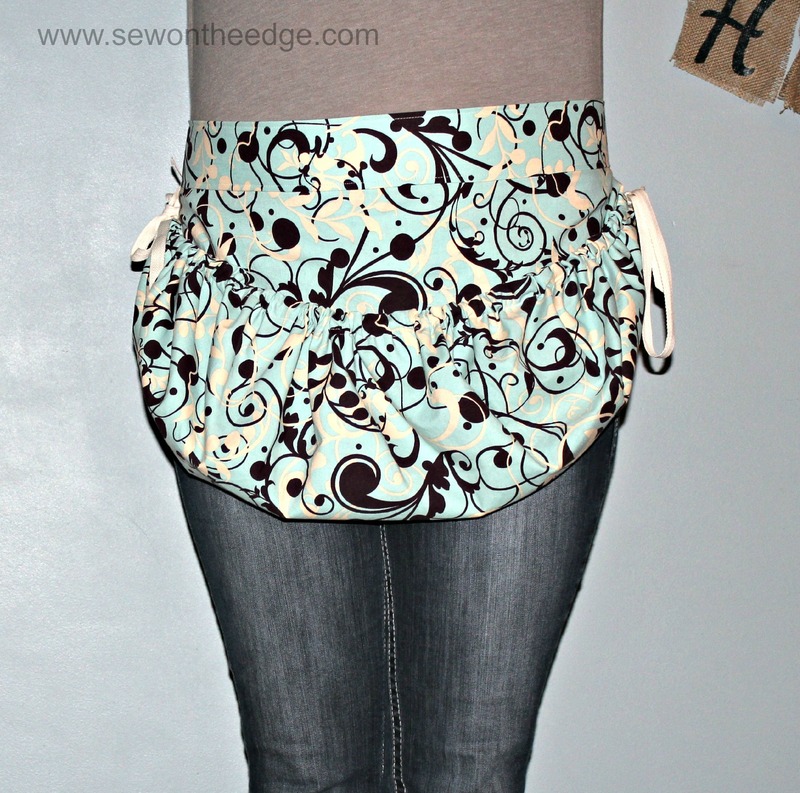 Enjoy your new apron this summer! Valentines Day is only a couple days away so I thought I should get with the program and finally get my Valentines stuff out. The boys are getting excited for their school parties this week. Oh what a joy it was to have each of them write 25-30 Valentines Day cards for their friends, I find this a little stressful when a 4 year old that has to write his name 25 times. 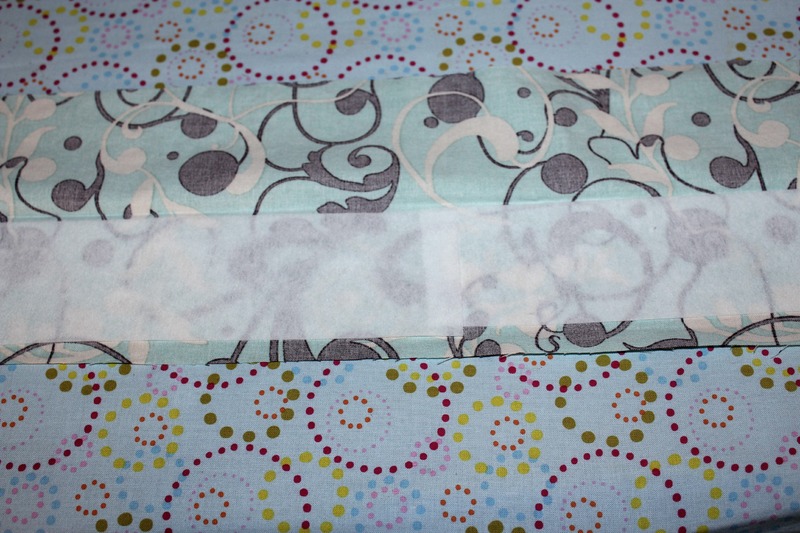 Heres a tutorial on the envelope pillow (no zippers needed) I made, I love how it turned out. 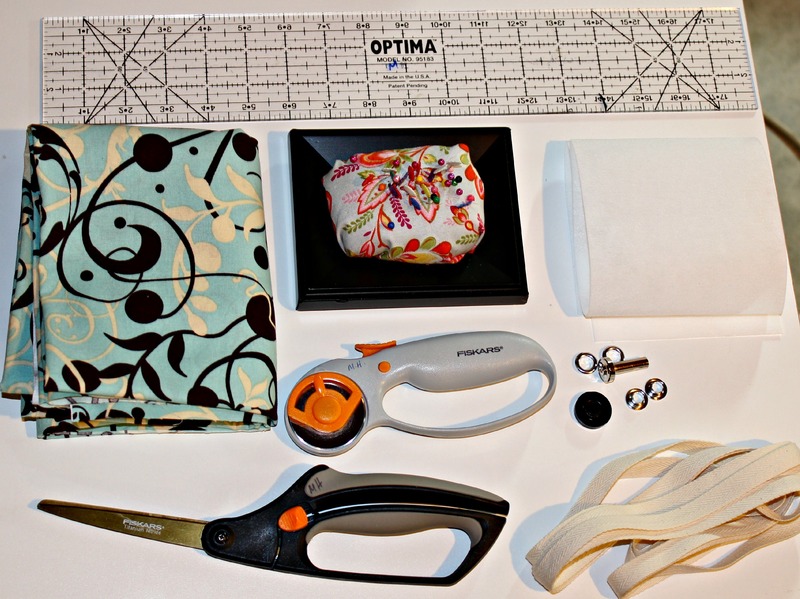 Take your 11.5″x17″ pieces and fold in 1/2 ” on the each of the 17″sides and press. Makes sure that if your pattern is directional that you do opposite sides so they line up like above. 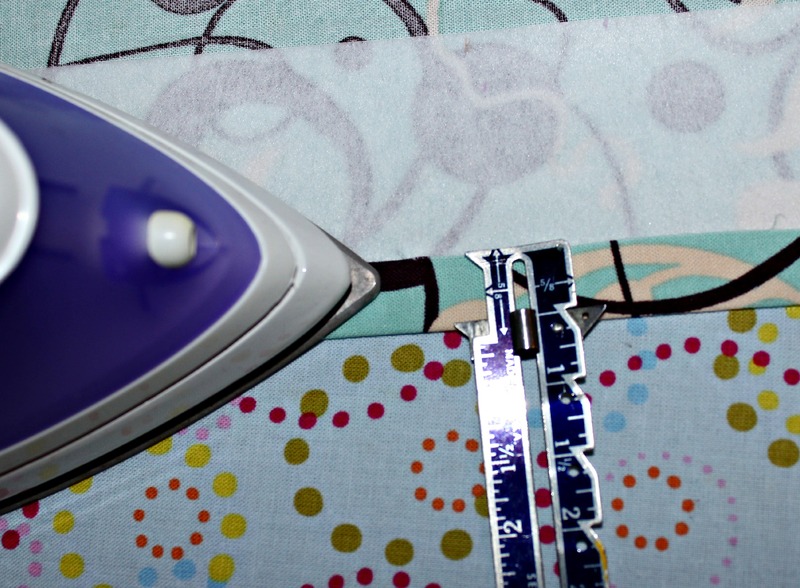 Then fold over again 1/2″ and press to hide your edges. 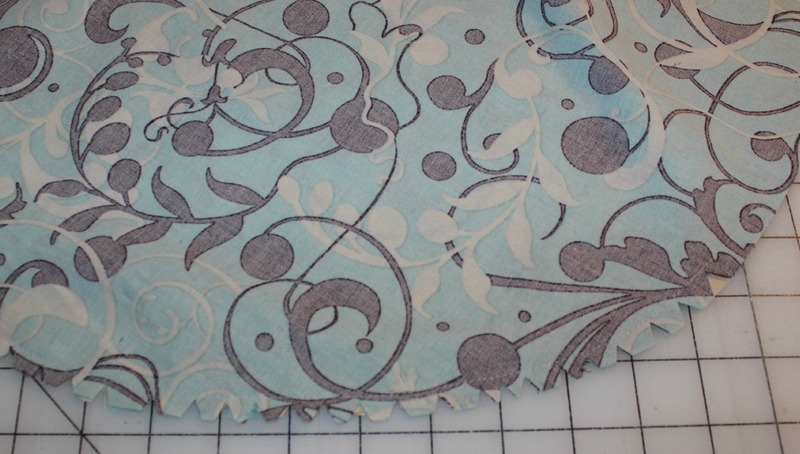 Top stitch using a 3/8 seam allowance on both sides. 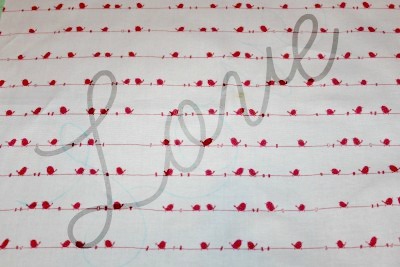 Using your disappearing ink marking pen,write the word Love across the pillow. Make sure that your start and finish is 2″ away from your edges. Start your ric rac by folding over the edge at the start of your word. Then follow your ink line with the ric rac pining as you go. When you get to the end, fold over the edge. 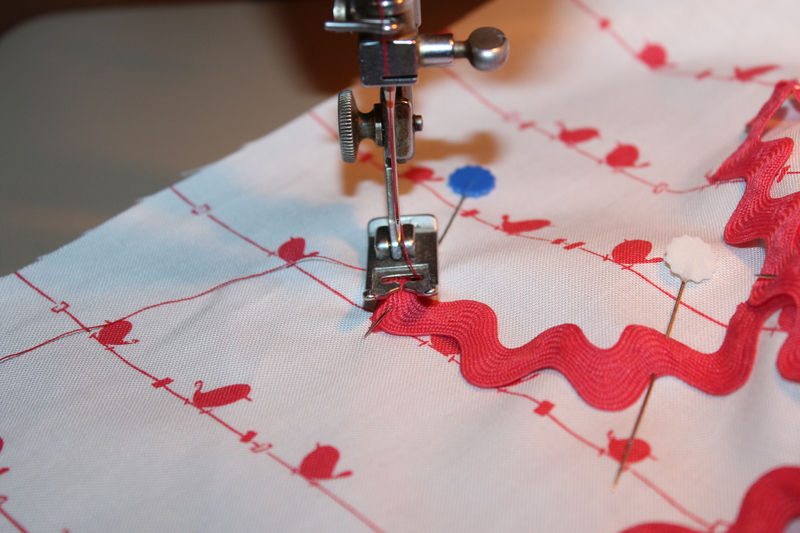 Slowly sew your ric rac in the middle, making sure to back stitch at the start and finish. Lay your 17″x17″ square with the word Love facing up. 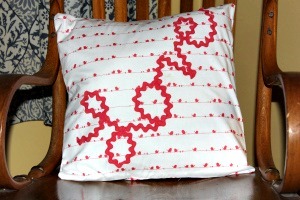 Take one of your back pieces and line it up with the side of pillow as show in above photo. 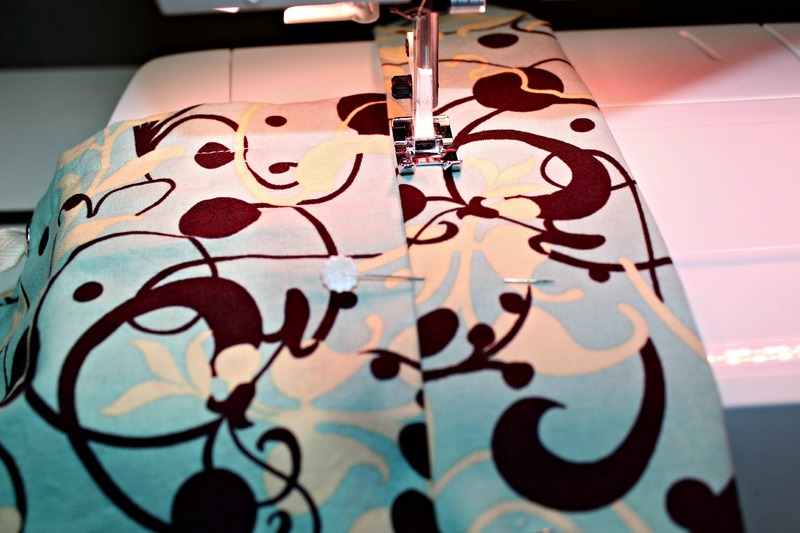 Take your other back piece and lay it over the first back piece so that your finished seams overlap. Pin all the way around pillow. 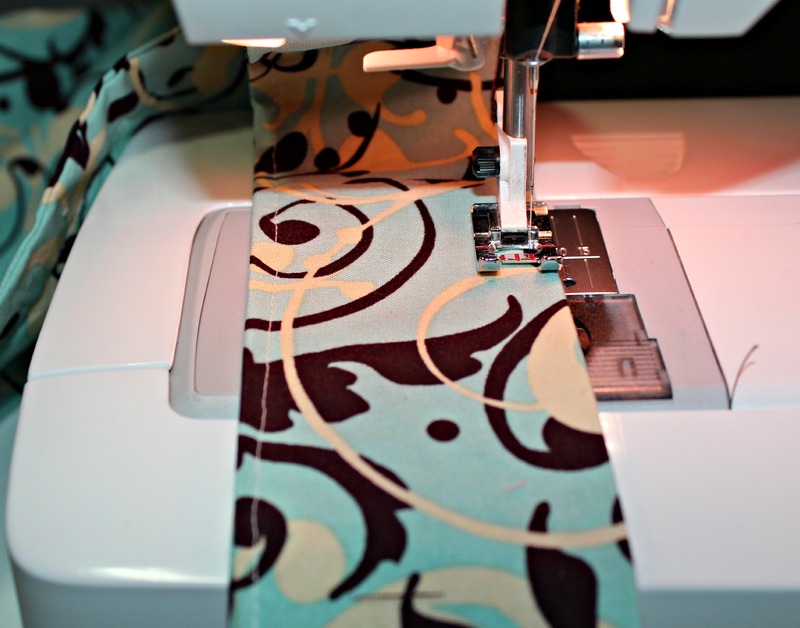 Sew around the pillow using a 3/8″ seam. I like to curve my corners but you don’t have to. Turn right side out and press. Then put it over your pillow form and enjoy. Think of all the pillows you could make, yours kids name, a wedding gift with the last name of the bride and groom, or the word Lucky for St. Patricks Day! Hope you have a great Valentines Day. My grandma recently went into an assisted living facility, at the time she was still living on the family farm at 91. However, she needs more help through-out her day, and the assisted living facility has been great with her care and also for her social life. Prior to her going into the living facility my mom and aunt went through her cupboards with her. This has resulted in several tables full of treasures that she wanted us grandchildren to go through and take what we wanted. Ok, lets be real honest there were some things on that table that should have been thrown away in the 70’s. But, I did manage to find a few real treasures. 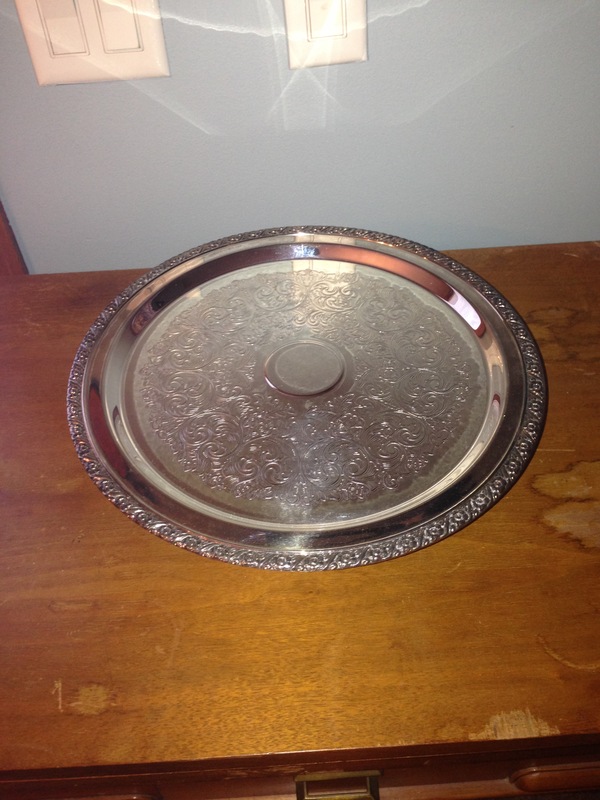 I found a silver cake stand that someone had giving my grandparents on their wedding day and another silver plate that someone had given my great-grandparents on their 25th anniversary. Both were covered in tarnish, but nothing that a little time on Pinterest could not help me with. But, what I was most excited about was a bag full of aprons. Aprons were stored in an old bread bag..my grandma was thrifty and eco-friendly before it was the cool thing to do. When I got home and had time to really look at the aprons, I was blown away at the precision and details that she had when making these aprons. I can just picture her wearing these with the ladies from church serving one of the many dinners after the church service. Growing up, I can hardly ever remember her wearing something that she did not make. She had the mentality if she wanted something new to wear, she made it and her sewing skills are proof of that. 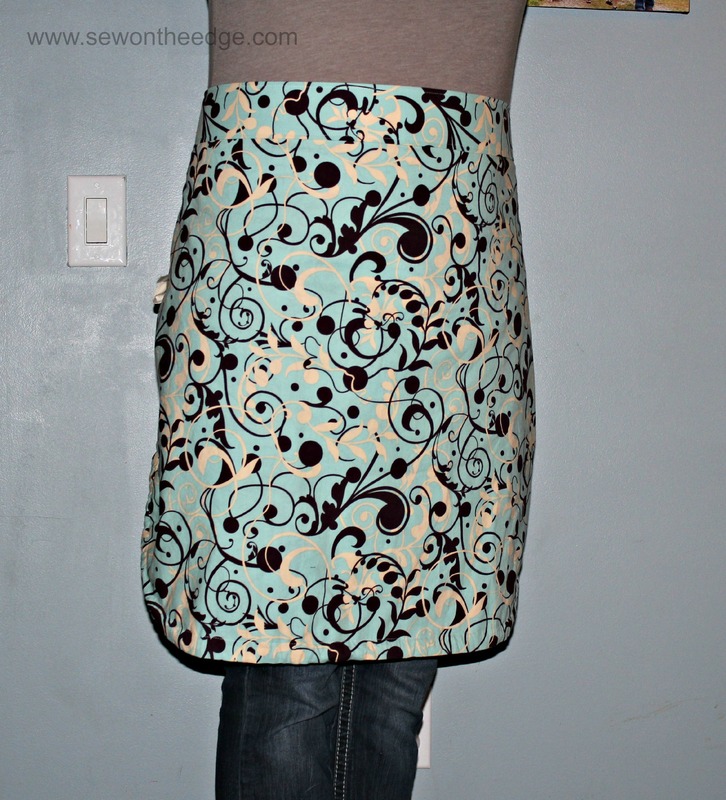 Looking at the aprons takes me back to days when I would go to her house to make a sewing project for 4-H. At the time, it was more of a chore and I am sure that I was not the best student. 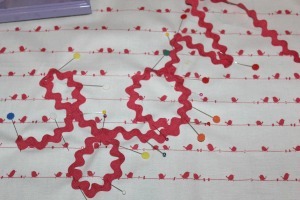 I was to busy with my friends to want to sew. Now that I am older, I can look back and appreciate the sewing skills that she taught me. 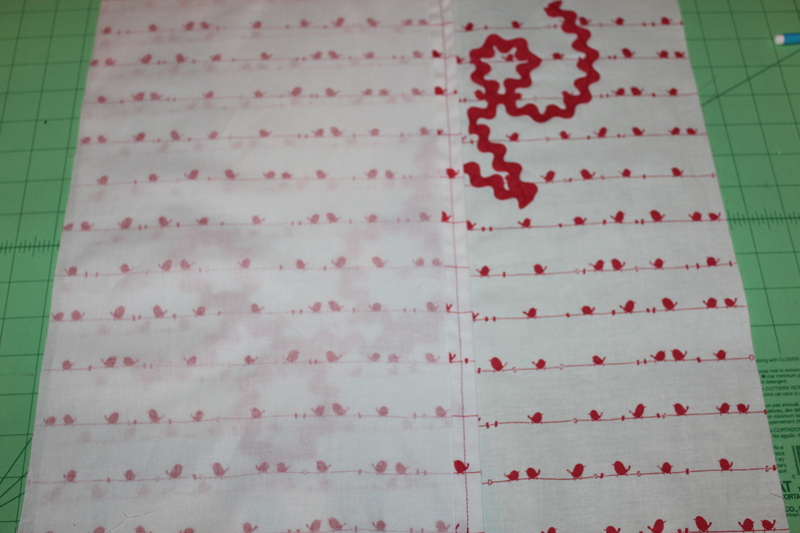 There are days when I sit down at my sewing machine and think about her and some of the projects that we made. Those are memories that I will forever cherish, and I hope that someday I can have a fraction of the skills she had with a needle and thread. 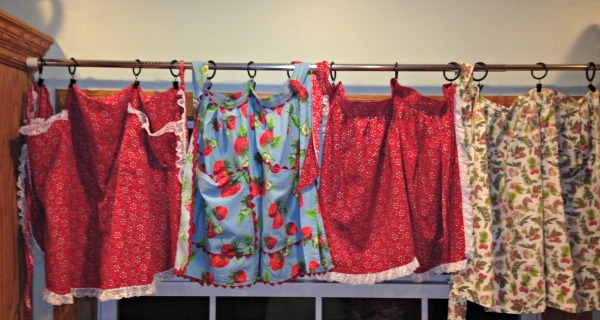 After much thought to what I was going to do with the aprons, I finally decided that that they would look great over my kitchen sink as my new curtains. Right now I have them on a tension rod, I am trying to not make to many holes in the walls since we are going to put our house up for sale this spring/summer. I love that I get to see them every time I walk into the kitchen. 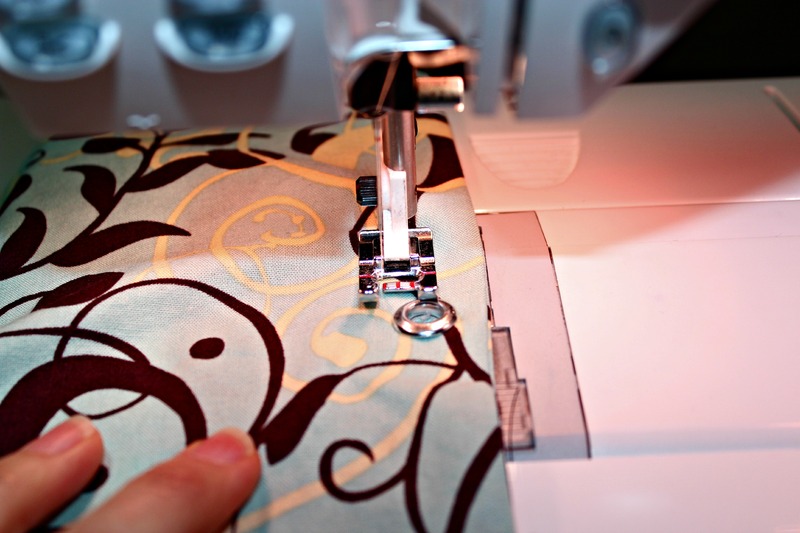 Do you have sewing memories for your mom or grandma?Or special things they have sewn for you?